This publication provides recommendations to assist those involved in overwing fuelling of civil aircraft to ensure that the correct fuel grade is always delivered to an aircraft; thereby preventing aircraft misfuelling. For the safe operation of aircraft, it is critical that a system of procedures and specific equipment is implemented to ensure the correct fuel grade is always delivered to aircraft during overwing fuelling. The delivery of an incorrect grade of fuel to an aircraft can have severe consequences that may result in engine failure. 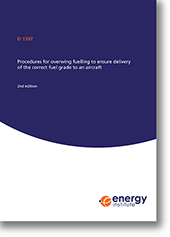 This publication provides a system for use by aircraft fuelling ground staff to assist with the delivery of the correct aviation fuel grade to an aircraft during overwing fuelling. Misfuelling incidents have occurred at single fuel locations when aircraft have landed and requested fuel unaware that the grade they require is unavailable. Therefore this publication is applicable equally to locations that supply only jet fuel or only Avgas, as well as those locations that supply both grades. The EI has developed a free poster for download that highlights the importance of EI 1597's good practice recommendations for the prevention of misfuelling incidents. It can be displayed in aviation fuelling facilities digitally or in print.